An expert assembles a team to work together and defeat the bad guy. Ocean's 11? Nope, it's The Magnificent Seven, which reminded me a bit of that film except instead of robbing a casino, the team is running an evil robber baron (Peter Sarsgaard) out of the town that he stole from its inhabitants. This version is also based on the 1960s movie of the same name, with Steve McQueen, except that version took place in Mexico instead of the Wild West. Chisolm (Denzel Washington) is recruited by a widow, Emma Cullen (Haley Bennett), whose husband (Matt Bomer) was murdered when the robber baron Bartholomew Bogue (Sarsgaard) rolled into her town and took it for himself. Emma wants to take back the town, and also get revenge on Bogue. Chisolm knows he will have to hire a larger team for this, so he recruits Josh Faraday (Chris Pratt), Goodnight Robicheaux (Ethan Hawke), Jack Horne (Vincent D'Onofrio), Billy Rocks (Byung-hun Lee), Vasquez (Manuel Garcia-Rulfo), and the Native American, Red Harvest (Martin Sensmeier), as part of a crack team of experts who all have special skills in fighting. They also prepare the townspeople for a fight, and when Bogue hears of this, he assembles his own team, for a final showdown at high noon. My parents really liked this movie because it reminded them of old-time classic Westerns, and I really liked it because it was a great "shoot 'em up" movie. The entire cast was excellent, but standouts included Washington as Chisolm and Sarsgaard as Bogue, who we later find out have a past connection to each other, and Pratt and D'Onofrio as members of the team. The rest of the team is very good, as well, but I almost wish Sarsgaard had more screen time, as he was fantastic as the villain here. Yes, see this movie. If you're a fan of action films, Westerns, or "shoot 'em up" movies, you will enjoy The Magnificent Seven, and based on its star power alone, it should draw a crowd to the box office to see it. I haven't seen the 1960 film upon which this one is based, but it sounds like a few things (location, etc.) may have been changed from that version. That being said, I'll see any movie that Denzel Washington is in, so when you add some of my other favorites such as Ethan Hawke, Chris Pratt, and Peter Sarsgaard, you know you're in for a good film. 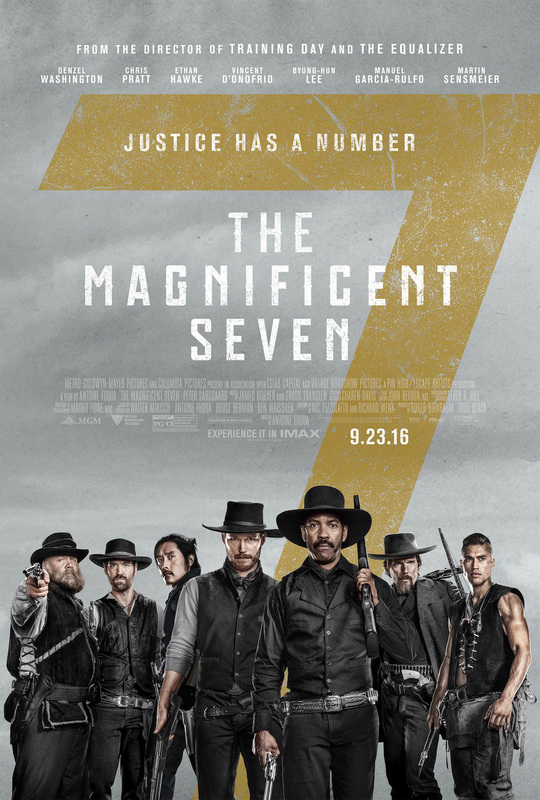 The Magnificent Seven is in theaters today, September 23rd, and is rated PG-13 with a runtime of 132 minutes. 4 stars out of 5.